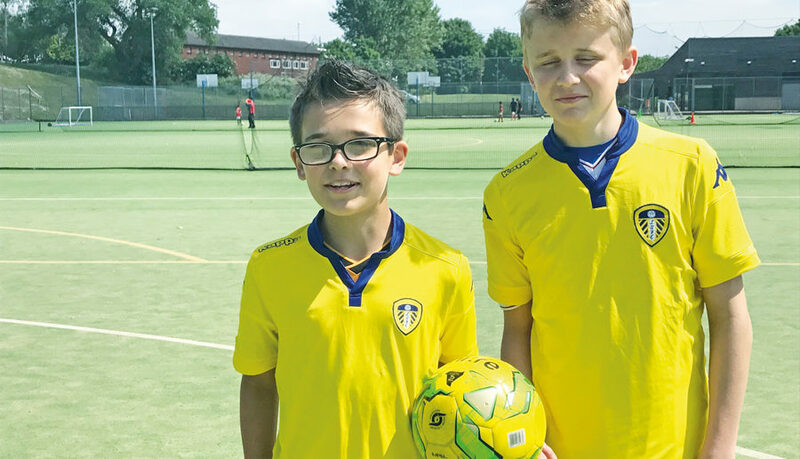 A young boy who lives with a rare eye condition has improved his general health, well-being, physical mobility and co-ordination thanks to The Leeds United Foundation ‘Ability Counts’ sessions designed specially for visually impaired children. Rhys Swift, aged just 12, lives with glaucoma which affects both eyes and is the most common cause of sight loss. He also has aniridia causing the absence of both iris and usually affecting both eyes. Rhys has always played football and prior to joining the specialist sessions, played in mainstream teams. Due to his condition, the youngster found it extremely challenging to play with a white football, often failing to locate the ball or players who were wearing white kits. The young player now travels over 122 miles from Leyburn, North Yorkshire, with his dad to come to the specialist programme held at Thomas Danby Sports Campus in Leeds. Fully qualified Foundation coaches work with young players like Rhys to improve co-ordination, general play and confidence. During the sessions an orange ball is used to ensure that the players can see the ball at all times. Due to his increased confidence and ability, Rhys has now gained a place on the Disability Player Development pathway and is set to complete a four week talent programme for visually impaired players and take part in an England training camp for six weeks. David, Rhys’ Dad, said: “The Leeds United Foundation have been so helpful. Rhys is finding playing with other visually impaired kids better for him as they have had a similar experience. As a parent I have seen how much the sessions have meant to Rhys, it is like he has found his element.